Fun fact: I first met Augmania CEO Rania Reda during her TED talk at my alma mater! The passion from Rania, other speakers, and the organizing TED team that night was palpable. A year later, it inspired me to join the TED community myself. Without a doubt, the experience remains among the closest to my heart throughout my young career. So as a former TEDster myself, allow me to elaborate on what makes TED and TED talks so reputable. TED as an organization is founded on a simple yet wonderful principle: ideas worth spreading. Duly, audiences have come to expect TED talks to provide them with novel, provocative, well-researched, and well-presented ideas. They know that a TED stage is the last place on Earth to find money scams or cheesy acts. The cherry on top? TED talks generally are not allowed to last over 18 minutes. TED curator Chris Anderson (bless his benevolent heart) believes that’s the most a speaker can hold attention of viewers. Eventually, the success of the TED formula gave rise to a monumental cascade with the creation of TEDx events. TEDx events are TED-licensed yet independently organized. That is, TED gifted its stage to thousands of communities to share their own ideas. When I joined my university’s TEDx, I saw that it didn’t matter how far we were from TED’s headquarters. ‘Ideas worth spreading’ was still at the core of literally everything we did. The TED acronym stands for Technology, Entertainment, and Design. The TED stage has seen a who’s who of tech pioneers showcase their new tech to the masses. As one of the world’s most impactful technologies, Augmented Reality is unsurprisingly featured in TED talks aplenty. Alex Kipman, a tech aficionado and a key Microsoft player, has been growing frustrated with today’s tech. He believes that the most popular technologies today only serve to trap us inside pixels. Ultimately, Kipman longs for a day when humans are set free from devices and allowed to interact once again. In his TED talk, Kipman demos the Microsoft Hololens. He goes on to explain how its premise of projecting holograms is the fitting technology for our non-binary universe. The target Kipman has in mind is a technology that “understands humans” rather than limiting them. To achieve that, he attempts to view our world from the perspective of a machine. I may have spoiled a bit his Ted talk for you, but I honestly don’t feel guilty. That’s because there’s still a lot more amusement in this mighty interesting visually stunning talk. At first, this TED talk sounds like an introduction to what AR is before quickly taking an intriguing turn. Bob Sumner is an animation and gaming expert. He’s the Associate Director of Disney Research Zurich. His TED talk examines how AR potentiates creative output. Specifically, he sheds light on that topic due to worries about the increasing passiveness of children. The kids may not be to blame, but it’s still an issue that Sumner wishes to act upon. Moving on, the TED talk progresses as Sumner starts showing many demos of his Augmented Creativity children games. These games encourage users to engage in many activities from painting to composing music. This TED talk from former NFL player Chris Kluwe tackles the use of AR in sports. He starts with the use of technology in general in copying sports experiences. After going through GoPro 360 videos and VR, he gets to the edge AR offers in that aspect. AR will more than just let fans and coaches see what a player is seeing. It will transform how American football as a whole is played. Footballers will wear AR-enabled helmets. These helmets overlay important data over players’ field of vision. This data, obtained from cameras monitoring stadiums, helmet sensors, and accelerometers, will allow players to strategize better mid-game. Thus, a purely athletic contest turns to one where players must know how to use data to their advantage. Surgeon Nadine Hachach-Haram uses her TED talk to reflect on the use of AR in a noble cause. She reports that 5 billion people don’t have access to surgeries. When these people need to undergo surgeries, they have to travel elsewhere. Needless to say, that’s a costly move. That’s especially true when you consider that a majority of these patients live in economically compromised areas. Dr. Nadine has an AR solution for this medical crisis. Instead of making patients’ surgery travels more affordable, she wants to train unexperienced surgeons in the patients’ countries. That’s why she has come up with what she called remote surgery. Essentially, it allows renowned surgeons to teach young surgeons good surgery practice using AR headsets. In her TED talk, Dr. Nadine showed many examples of the project’s success in different countries. I may start by digressing a bit here. But if you’ve never seen Marco Tempest before, get ready to meet one of Earth’s most extraordinary people. Super impressively, Tempest has a habit for finding intersections between his very different passions. His first passion as a child was magic, but as he grew older he fell in love with technology. Today he calls himself the technology magician and he has worked on loads of projects to validate that name. Tempest was one of the first speakers to bring AR to the TED stage. In this incredibly entertaining TED talk, Tempest uses AR as a modern platform for magic. It’s a reminder that while AR sure can solve our problems, it can also put smiles on people’s faces. As for Marco, I’ll have you know that he recently connected his passion for space to tech. By working with NASA. Yep, NASA. I would say ‘goals’, but that would still be an understatement. You’ve seen for yourself how AR has been mesmerizing audiences even on a stage like TED. It’s time for you to get your hands on AR too! Sign up now to Augmania’s Web AR platform and explore all the magical possibilities you can create using AR! Hello there, lovely people! This blog post will tackle all you need to know about No Code development platforms. By the end, you’ll learn why No Code solutions are a dream come true for so many businesses. But first, let’s start with a quick internet experiment. Head over to Google. Now, just type in the word “logo”. Immediately, you’ll find that most search suggestions revolve around logo-creating tools. Even you’ll notice that most of these tools actually automatically generate logos for users after extracting some info. Perhaps, that’s because entrepreneurs with newly-founded ventures won’t invest, either time or money, into hiring graphic designers. No matter the reason, though, other entrepreneurs saw a demand, acted on it, and are currently reaping their rewards. Other than logos, there are also online generators for slogans, blog ideas, and even memes. In the year 2019, there’s no reason the same concept can’t be applied to coding as well. Young entrepreneurs may possess a vision that can transform entire industries. Yet an algorithm could be all that’s stopping them from implementing that vision. But not anymore because that’s where the No Code wave comes in! Today, there are a few Free Code platforms where users could actually take advantage of advanced tech without writing a single line of codes. Regardless, they are most needed to allow users to capitalize on their visionary ideas and bring them to life without having to acquire technical knowledge. They’d merely need to drag and drop and within moments they’d have the software of their dreams. Now, let’s take a look at all the magical perks of using No Code development platforms. So far, we’ve mostly discussed how the No Code platforms benefit youngsters on their entrepreneurial paths. However, these platforms can also be of great service to big corporations. Such corporations with large numbers of employees need specific software to ensure smooth operation. This software may be as simple as one which employees use for input of their arrival and leaving times. Some companies create this software and sell it to multiple clients. The problem is, not all organizations operate similarly. Each has its own needs. Thus, there’d have to be a degree of customizability. That’s what can be achieved using Code Free tools. Each organization can use it to create its own experience that helps facilitate its needs. Ultimately, when an organization has its own tailor-made applications, its operational efficiency and productivity will sore through the roof. Creativity is all about bridging gaps between problems and solutions through innovative ideas and engaging experiences. Despite that, with coding, at times, it is hard to implement the vision users have in the same creative way they’ve imagined it since they are always held back by technical obstacles as if codes generate whole new problems for them and put restrictions to how far they can go with their imagination. This is exactly why free of code tools go hand in hand with the boosting users’ creativity, as it overcomes any technical limitations they might face to give them more space to focus more on the experience itself instead of the code behind it. Therefore, they’ll create interactive experiences and creative solutions that add value to their business. Believe it or not, until the early 20th century, there was an actual occupation as a “human computer”. The job of these individuals was to handle tedious calculations for organizations. They had no say whatsoever in operations and they just had to follow a specified set of rules. That was until humanity invented computers and disposed of such exhausting job and skill. It may be crazy to hear that such a job once existed. But, honestly, I wouldn’t be surprised if I read blogposts in 20 years scoffing at the idea of coders. Coding will be looked at as tiresome and superfluous as we look at human computing now. Still, coding won’t be essential to hacking some disruptive technologies and integrating it to achieve predefined business goals. Founders won’t have to learn a ton of coding languages to build prototypes and experiences around it. This will free them up to focus on other tasks allowing them to scale faster. And when they do need coders, it won’t cost them as much as hiring full-time developers. Hence, No Code platforms are most certainly economic too. All that pushes entrepreneurs to venture into technological areas they see potential in with no hesitation. One area some venturers have hesitated about entering is Augmented Reality. The coding behind AR experiences might be especially complicated. But at Augmania, we are working hard to help make AR accessible for the public through our code free platform! AR is novel, accessible, versatile, and ultra fun. That’s why Augmania pioneered a No Code platform for AR content creation. We believe in democratizing AR as a tech. In other words, AR should be for everyone. It’s too stimulating of a technology to only be accessible to developers. So now all you need to use the Augmania platform are creativity and an understanding of your business needs. You’re only one step away from where all the magic begins. Sign up now to Augmania’s Web AR platform. It’s what dreams are made of! Full disclosure: we recently committed a clumsy mistake. We published a list of the top SaaS conferences to attend in the US. It was a big ol’ Howdy to all our statesider friends. Then, we felt bad about it. Sure, Augmania is based in the US of A. But, Augmania still wants to be friends with everybody from all over the world. We want to have friends in Europe, Asia, and welp, why not Antarctica too? So as a token of apology, we present you the 5 international SaaS conferences you need to attend in 2019. Thankfully, SaaS is such a universal language now that it wasn’t hard at all finding international SaaS conferences. Actually, it was pretty hard picking just 5 international SaaS conferences. Nonetheless, our picks are highly diversified. We made it that way so it could fit everyone’s tastes. Whatever you’re setting out to accomplish, you’ll find at least one conference is the perfect destination for that. And because we still feel guilty, we’ll help you decide which ones to attend. That is, if you don’t have any specific goal in mind. The crucial thing to consider is what value attending one of these international SaaS conferences will give you. Are you looking to demo your products? Are you looking for new hires or even to get hired? You may be attending just for the knowledge. In that case, assess if the knowledge will be worth the money and time you put into a conference. So the important lesson here is to do proper research while fixating on how attending gives you an edge. Coming off the heels of a benchmark-setting SaaStr Annual, SaaStr’s making its presence felt once again this year. Except for this time, it will be in the beautiful Paris with SaaStr Europa. Honestly, we couldn’t recommend a SaaStr conference enough. Augmania was at this year’s Annual and we can tell you it was a blast in every way possible. The diversity of speakers, the caliber of passionate attendees, and the thoughtful organization made for an outstanding experience. In fact, it was so outstanding we created a blogpost just fangirling about it. Last year, SaaStr Europa debuted with the slogan: Scale. Share. Learn. This perfectly describes what SaaStr conferences are all about. Sure enough, the international SaaS conference was everything one would expect out of a SaaStr event. Despite that, there was only one setback to the international SaaS conference. It was only one day. However, all that changes this year. SaaStr Europa is back in 2019 for two days. Organizers say the international SaaS conference will have 200% the content from last year. Now, that’s something to get excited about. SaaStr Europa takes place on the 12th and 13th of June at Paris’ Maison de la Mutualité. The city of lights gets some more love once more with this international SaaS conference. What makes B2B Rocks stand out is undoubtedly the attitude. Quite simply, its organizers pride themselves on holding a conference that guarantees “100% no-bullsh*t”. As edgy as that sounds, it’s at the core of everything at B2B Rocks. The international SaaS conference strives to be as hands-on as can be with no babbling whatsoever. One way they do that is by limiting sessions to 25-minute slots of technical insights. Further, the conference is limited to only 500 founders. That way attendees can maximize networking opportunities. B2B Rocks Paris will be on the 12th of September at Station F Campus. Also, if you happen to live in the land down under, B2B Rocks has got your back. The international SaaS conference takes it to Sydney on the 6th and 7th of June at Lendlease Headquarters. Over 3000 startups, investors, and all-around game-changers are heading to London for Startup Grind Europe. They will all gather to talk everything about their undying passion, entrepreneurship. The organization behind the international SaaS conference, Startup Grind, is eminently ambitious. It aims to connect and inspire entrepreneurs everywhere on Earth. Duly, it now has over 2000000 connections of entrepreneurs from 125 countries. The Startup Grind Europe conference is just one of the initiatives the entity takes to support its entrepreneurs. It takes place on June the 6th at the Central Hall Westminster. Augmania recently attended the Startup Grind Global conference in Silicon Valley and found it mighty insightful. So based on personal experience, we highly suggest you attend Startup Grind Europe. The “Disneyland for SaaS companies” is how SaaStock puts it. Interestingly, the international SaaS conference’s sessions are divided into bootcamps. Each bootcamp tackles a specific essential for SaaS founders. Last year’s SaaStock had 8 bootcamps. These included growth bootcamp, sales bootcamp, and CEO bootcamp among others. While the agenda for 2019s SaaStock hasn’t been released, the conference has been growing exponentially from year to year. Thus, it’s expected that the 4th ever SaaStock will be bigger than ever. The international SaaS conference takes place in Dublin as usual between the 14th and 16th of October. Okay, we should be unbiased, but something needs to be clearly stated. Web Summit is where’s it’s at. Period. Remember the part where we told you to think wisely whether a conference could provide the value you need? Well, whatever value you’re looking for, you’ll sure as day find it at Web Summit. Taking place every year in Lisbon, the international SaaS conference features 24 tracks! SaaS has it own track called the SaaS Monster. This international SaaS conference focuses on 4 sectors of SaaS: big data, cloud, security, and enterprise technology. For each sector, a group of leading experts holds intensive sessions, workshops, and roundtables. Best of all, though, if you buy tickets for SaaS Monster you get access to all 24 tracks. Other tracks include Startup University which tackles everything startups. There’s also the appropriately named marketing track, PandaConf. There are tracks for health, sports, cryptocurrency, robots, and pretty much anything you can think of. Attending sessions from all these tracks is an invaluable advantage that Web Summit offers. It helps attendees find areas of collaboration with industries they’re not involved in. That’s how SaaS entrepreneurs can take the helm and stay ahead of the curve. To tell you the truth, Portugal may have been famous for Cristiano Ronaldo. But now it’s famous for holding Web Summit. 2019’s 4-day extravaganza takes place from the the 4th to the 7th of November at the Altice Arena. Also, the people behind Web Summit organize international SaaS conferences in other cities with slightly modified tracks. Toronto has Collision and Hong Kong has RISE. Believe it or not, Sophia the robot, will be a speaker at this year’s RISE! What an exhilarating week last week was! Yes, the 53rd Super Bowl took place last week. And surprise surprise, Pats won again, Brady is still the GOAT, and fans complained online as per usual. Unfortunately, the “Big Game” was nowhere near exhilarating. Absolutely exhilarating last week, however, was SaaStr Annual 2019! We’ve discussed before the importance of attending industry conferences here on the Augmania blog. We also listed the must-attend US SaaS conferences this year (stay tuned for the international SaaS conferences blogpost). SaaStr Annual was on our list and for good reason(s). This year, thousands from all around the globe attended the fifth iteration of the mega-conference in San Jose. Flocks from as far as Dublin, Johannesburg, and even Tasmania devoured insights from a who’s who of SaaS experts. This diversity was also palpable with the choice of speakers. Obviously, we at Augmania couldn’t have missed SaaStr Annual for the world. We got to witness all the action first hand and we enjoyed every bit of it. For years, the marketing funnel has been a reliable marketing model for marketers. It perfectly describes each stage of a customer’s journey with a brand. This allows marketers to choose wisely which assets to use during first interactions versus before purchase, for example. However, one flaw keeps funnels from being fully efficient marketing models. Somehow, this flaw has gone unnoticed for years. At SaaStr Annual, HubSpot CEO Brian Halligan shed light on this flaw. It’s that funnels don’t take into account how customers can help brands grow. Funnels look at customers just as targets not living breathing souls. In a time where consumer trust is getting harder and harder to acquire, word of mouth is especially invaluable. Yet, funnels have largely ignored the impact of customer trust on brands. As CEO of one of the world’s most reputable marketing platforms, Halligan is inviting marketers to retire funnels. Instead, he introduced us to marketing flywheels at SaaStr Annual. In general, flywheels are known as energy-efficient tools. It’s no different from the marketing flywheels. Marketing flywheels help you preserve the energy put into converting customers rather than start anew. That is, they encourage customers to become part of brands’ growth by putting them at the centerpiece of everything. And by everything, we mean literally everything. Flywheels blur the lines between the responsibilities of teams marketing, sales, and CRM. They all work together on creating outstanding customer experiences; the kind that pushes customers to promote brands by choice. Surely, Halligan’s coining of the term marketing flywheels will push many marketing teams to restrategize. Yet some organizations have already been focusing on customer experiences, an approach also called conversational marketing, for some time. Look no further than the design of attendees’ experience at SaaStr Annual itself. The SaaStr Annual people thoughtfully organized the conference to help attendees make the most out of their experience. From Mother Rooms to an area for rescue dogs adoption, every attendee got whatever he/she needed. Also, the SaaStr Annual app was super helpful, allowing attendees to customize their experiences. All these aspects created an immensely inviting environment. Advertently, this environment gave way to a plethora of networking. Our very own CEO ended up having over 30 meetings during the conference! Another important element of marketing flywheels is customer feedback. 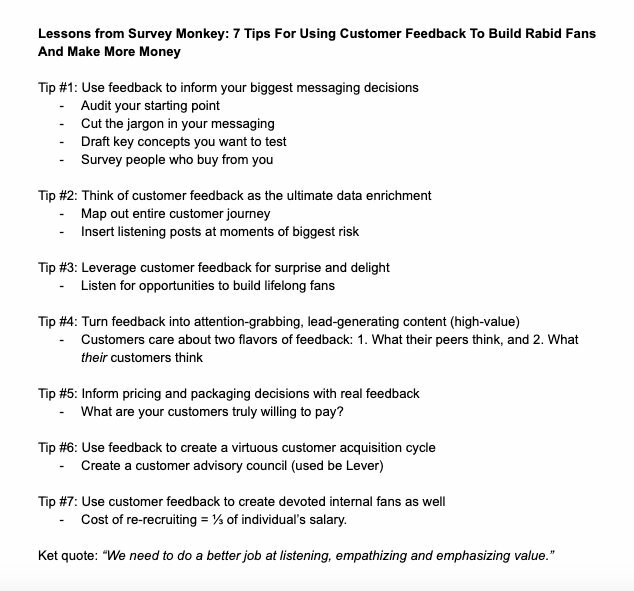 In a pretty insightful keynote, SurveyMonkeys CMO Leela Srinivasan gave 7 tips on how to leverage customer feedback. See for yourself! In case you couldn’t tell from the rocket ship logo, SaaStr Annual is all about growth. The conference prides itself on helping SaaS entities grow from $0 to $100M ARR. In its 2019 State of the Cloud session, Bessemer Venture Partners shared tremendous statistics. Today, 55 private cloud companies are valued at over $1B. 10 years, ago there weren’t any. The session also reported that public cloud companies are close to hitting a trillion dollars. These stats were encouraging for SaaStr Annual attendees in the sense that they showed the increasing demand for SaaS. On the other hand, they show how competitive the industry has become. To guide attendees through this challenge, BVP presented a few predictions on how the SaaS world will grow. Among these predictions is a rise in AI in SaaS. These robots will free up time for people to focus on more value-based tasks. Also, BVP predicts there will be more investments in efficient software within SaaS companies themselves. This software will aid company personnel in examining and tracking their products from all aspects. You can read a full report of BVP’s amazing session here! Organizational culture has fortunately earned lots of ground with many brands throughout the past few years. Gone are the days of being perplexed by the renowned Netflix Freedom & Responsibility culture presentation . In lieu, brands are now working on creating solid distinct cultures. That’s because they are aware of how that helps them achieve proper growth. As essential for SaaS entities, the culture was one of the main topics on the SaaStr Annual stage this year. “Crossing 100 Employees while Keeping Your Culture Intact” was a great panel featuring different culture leaders in SaaS. LiveRamp’s Anneka Gupta believes culture isn’t just an aspect that founders agree on as they start their entrepreneurial paths. No matter how well they design a culture, entrepreneurs must refine it as they scale, says Anneka. Melanie Tantingco, from Periscope Data, says companies should put culture values in front of their personnel everywhere they can. Appropriately, Melanie says she has employees with brand values on their screensavers. Moreover, every week during Periscope Data meetings, an employee shares how he/she implemented one value while operating. Augmented Reality is one of the key players in the SaaS world. It won’t take you long to understand why that is the case when you join Augmania’s Web AR platform! Sign up now! For all the resentment we give today’s age, we should be grateful for the current state of education. We’re seeing major strides everyday to make education more efficient and more accessible. Without a doubt, technology has immensely contributed to reaching that stance. Nobody can understate the impact of MOOC (Massive Open Online Courses), AI, and AR EdTech to name a few. Indeed, these technologies are effectively transforming the landscape of education as we know it. Imagine if the great Richard Feynman got reincarnated in a random contemporary era classroom. In one scenario, his reincarnation could take him to a room with desks and a good ol chalkboard. As such, he wouldn’t be all that unfamiliar with the layout of that room. In another reincarnation, he may struggle to even identify that he’s in a classroom. That would be the room of a student taking an MOOC at home. Yet the changes in education then versus now are far deeper than how classrooms look. Today, institutes armor students with all they need to create the change they want to see in their environments. Whereas back in the day, some educational entities merely focused on helping students secure future ordinary jobs. Professor Feynman would be mostly proud of modern educational systems, though, for they emphasize critical thinking and fundamental understanding. However, there’s one thing the Physics icon wouldn’t be fond of. And that’s how some of today’s educational techniques, including MOOC, limit us physically. Humans learn best by interacting with objects and seeing them from different angles. Thus, our minds are not wired to learn by observing through screens. So there is some sort of dilemma here. Online courses fantastically allow students to enroll in courses offered thousands of miles away from their homes. At the same time, they don’t fully capitalize on our brain’s capabilities. There must be a solution that reaches common ground. Well, it’s nothing AR can’t solve. AR EdTech can overlay all forms of content in front of users’ fields of vision. In this case, no matter where they are, students will be able to interact with materials they’re studying. Now while we’re at it, let’s take a look at the limitless perks of AR EdTech! Imagination is defined as the ability to form images of substances not present to the senses at a moment. Sure, imagination is important in education. Albert Einstein even famously deemed it more intelligence-indicating than knowledge. Accordingly, many teachers aim to stimulate their students’ imagination. In spite of that, many over the years have reported not being able to imagine things inside their brains. Researchers just recently started paying attention to the condition. They haven’t discovered enough about its causality or whether it affects subjects similarly. At this time, all we know is that the condition is called congenital Aphantasia and that it’s real. Still, we also know that we can use AR EdTech to aid those suffering from it. AR EdTech programs can help students see the tiniest details in objects of study. Not only see, but actually move the objects and interact with them as they wish. For instance, AR anatomy apps are brilliant implementations of AR EdTech. Med students regard anatomy as one of the toughest medical subjects to study. The apps make studying anatomy easier and more fun and improves students’ dexterity. Funny enough, this is why you’ll see med students always advocating for more AR EdTech. Many education passionates cite personalization as the ultimate goal for education. Each student has his/her own interests. Linking each student’s individual interests to the course he/she is taking will make him/her eager to study it. Another reason to push for personalization is that not all students have the same pace in learning. It’s an injustice to disregard this fact and it can deter slow-paced students from the learning experience. AR EdTech is one way to personalized education. Using a platform like Augmania, for example, teachers can create customized AR educational experiences for each student. The platform is entirely DIY and users don’t need design or coding skills to create AR magic. Further, teachers can also use AR EdTech to print AR-enabled worksheets for each student. That way each student will exercise according to his/her own pace. Impressively enough, new studies show that AR EdTech can also even accelerate learning paces. So far, we’ve discussed AR EdTech perks for students of all ages. But this perk is especially for children. For a few years now, parents have had concerns over their children’s increased screen time. Screen time is basically the time a human spends staring at a screen; be it a TV, a PC, or a smartphone. Attempting to reduce their children’s screen time, some adults resort to drastic measures. These measures work sometimes. Other times, they lead to conflicts and barriers between parents and children that may last forever. AR EdTech solves the issue of screen time in an unorthodox way. The main problem parents cite with screen time is that kids spend it idly with no physical action. Thankfully, AR EdTech can turn that upside down. AR EdTech can combine learning, physical exercise, and entertainment all together in AR games. Think of a Jurassic Park-themed game where players solve a mystery involving a chemical that makes all dinosaurs hostile. Through that game, kids will run, learn about different dinosaurs, and be entertained. Best of all, all of that will be screen time, but actually of the beneficial kind. We’ll keep this one short and sweet. According to a study by Mindshare, researchers discovered that the brain area responsible for encoding memory gets almost three times activity from AR content than from non-AR content. In other words, AR EdTech can improve memory retention by 70%. With that said, students can now much more easily memorize even the most boring bits of information they study. So lovely teachers now the chance to put all these wonders of AR EdTech to the test. Sign up now to Augmania’s Web AR platform and transform your students’ learning experiences!